Stocks bounced back this week as stocks (and investor sentiment) fell too far, too fast. 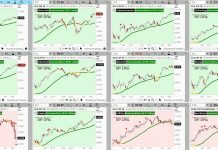 Here’s our latest look at key technical indicators and market trends for the trading week ending March 29, 2018. Key Takeaways: Momentum and breadth trends have continued to deteriorate this week even as stock prices have stabilized. Near-term sentiment showing enough pessimism to fuel a bounce. Absent a breadth thrust, however, it is unlikely to turn into a rally that has staying power. Volatility of first quarter likely to carry into second quarter. The S&P 500 bounced this week after making a new closing low (on a weekly basis) last week. 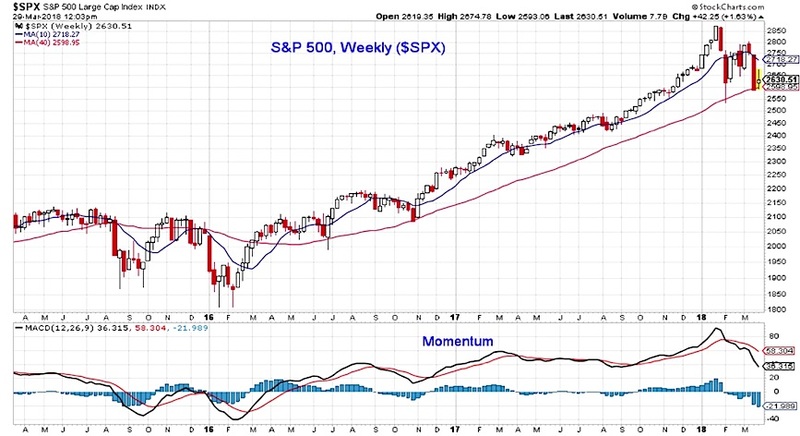 Weekly momentum, however, has continued to move lower and breadth trends have yet to meaningfully improve. Near-term sentiment has turned excessively pessimistic, with the surge in demand for puts being the most obvious example of that. A shift away from optimism in the weekly surveys is also starting to be seen (most notably the NAAIM indicators moved to their lowest levels since May 2016 this week), but it has not yet been sufficient enough to change the overall sentiment back-drop. 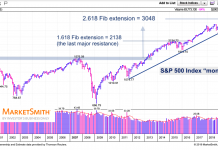 While stocks could add to this week’s gains, absent improving breadth and momentum trends, any bounce that is seen is unlikely to morph into a rally that has meaningful staying power. With the volatility backdrop being what it is this year, a move by the S&P 500 toward its 10-week average (near 2720) would not be too surprising. Support is near the 40-week average (and last week’s closing low) just below 2600. 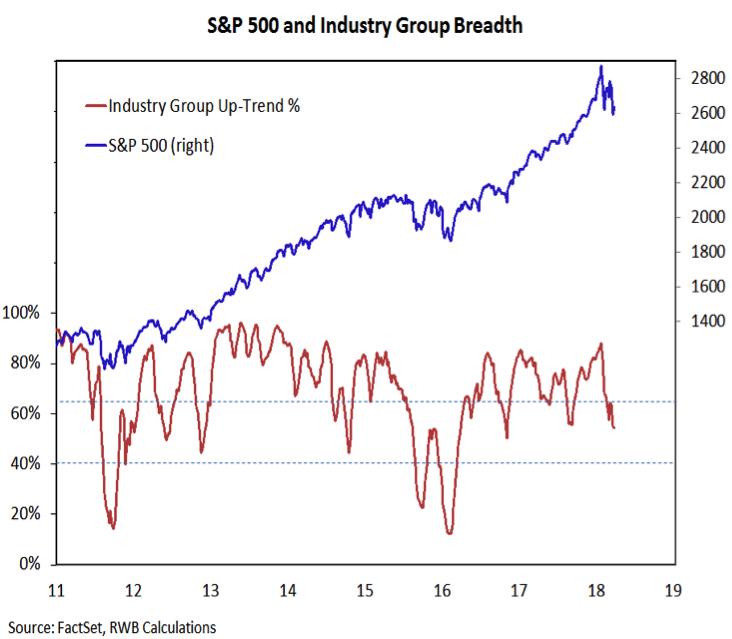 The percentage of industry groups in up-trends moved to its lowest level since November 2016 last week, confirming the price and momentum lows seen on the S&P 500. Despite the price rally on the S&P 500 this week, this breadth trend indicator remains near last week’s level. Since selling emerged in January, we have seen four days of downside volume outpacing upside volume by better than nine-to-one. The price rallies that have emerged in February and March have failed to unwind that downside momentum. The best we have seen was the nearly seven-to-one upside/downside volume seen earlier this week. We would like to see at least two days of nine-to-one upside/downside volume to have confidence that stocks have sufficient momentum to sustain a rally. 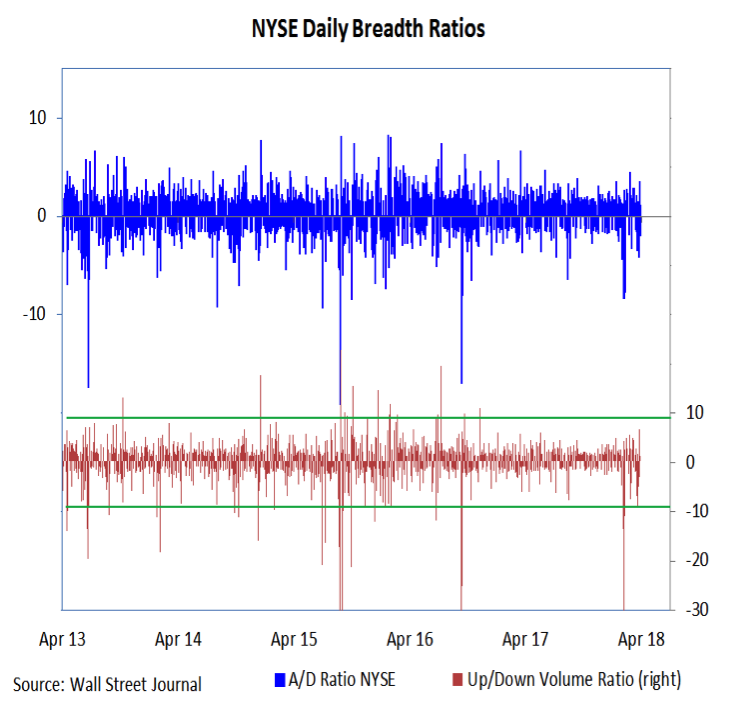 Other indicators of breadth thrusts (like the percentage of stocks above their 10-day average or the 10-day advance/decline ratio) have also failed to send bullish signals in the current environment. 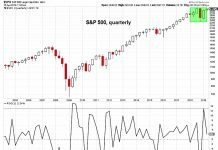 We are not seeing evidence to support the resumption of the cyclical up-trend, we are seeing sufficient pessimism to argue that stocks could continue to bounce off of last week’s lows. The NDR Trading Sentiment Composite has moved back into the excessive pessimism zone, and demand for put-options has surged over the past two weeks. The 10-day put/call ratio has moved from a multi-year low in January to its highest level since the 2016 elections. 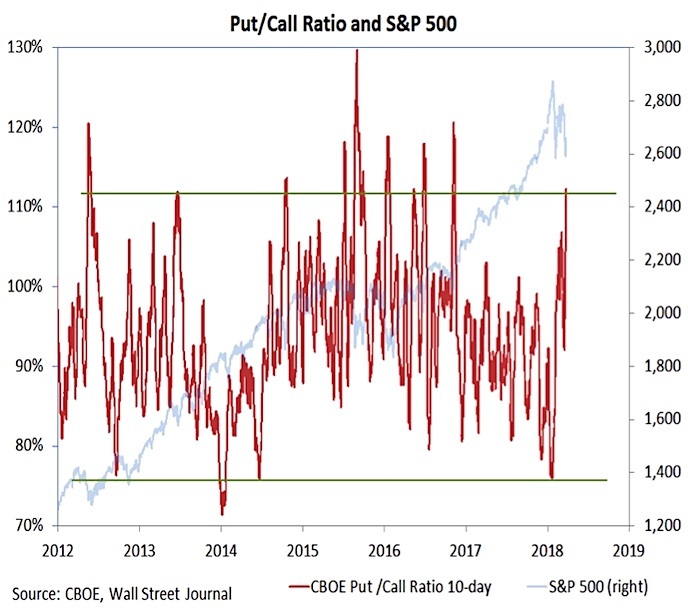 Surging put/call ratios historically signal an opportunity for a near-term bounce in stocks, but may not be sufficient to sustain a rally (as mentioned above, the breadth backdrop needs to improve). 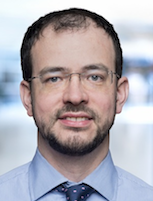 With the breadth backdrop arguing for further consolidation and near-term sentiment supportive of a bounce, the second quarter might offer more of what was seen in the first quarter – lots of volatility with little aggregate movement. 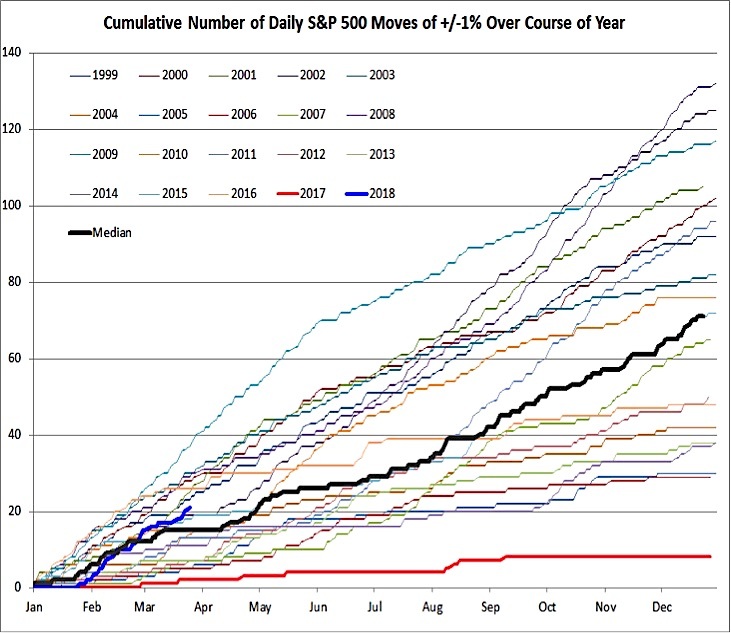 The first quarter of 2018 has seen over 20 daily moves of 1% or more. This is up sharply from 2017, but is not too far from the median experience of the past 20 years. In fact, the first quarter of 2018 has had nearly as many 2% daily swings (6) as all of 2017 had 1% moves (7).